Digestive Enzymes are incredibly important in the process of digestion. Saliva, fruits, and vegetables contain enzymes that help us digest foods. However, since our processed foods were introduced those digestive enzymes became less and less present in our foods. That being said, if you follow a raw food diet, you are ahead of the game (kudos). Wade lighthearted 3-Time Canadian Natural Bodybuilding Champion, and one of the world’s premier authorities on Natural Nutrition and Training Methods stresses on the importance of enzymes in your diet, especially when consuming a variety of cooked meals– as most of us do. Research has shown that any food that is heated above 118 degrees loses all of its enzymes. In other words, all cooked food is deficient in digestive enzymes. Processed foods, irradiated foods, foods grown with pesticides, chemical fertilizers, or on mineral deficient soils all have minute levels of enzymes that occur naturally. Our bodies are actually designed to recognize the taste of enzyme and nutrient dense foods by seeking foods that break down easily, and taste sweet. Anyone who has eaten a vegetable or fruit at an organic garden or farm will quickly attest to how different organically grown enzyme rich foods taste. Digestive enzymes are regularly found in fruits and vegetables. They are required for the breakdown and digestion of food and fall into 4 main digestive enzymes and a whole pile of other enzymes and enzyme precursors. Sucrase and lactase are a couple of familiar ones you may be familiar, mostly because some is unable to digest certain foods because of a lack of that enzyme. Adding enzymes to your smoothies, or snacks is a great way to add enzymes to your diet. However, the best time to take enzymes supplements is before and during a meal (sprinkled over it) in order to help the body predigest the foods. Wade lighheart makes really good enzymes and you can visit his website to learn more about his product. However, If you are looking to supplement enzymes that are great and a bit more affordable here are the enzymes I use . Do you supplement enzymes and if so what are your favorite ones? Also, what foods are known to contain “natural digestive enzymes’? If you want to naturally increase energy, mental focus, and performance naturally, Maca powder should be part of your daily wholesome food and supplements routine. The maca plant, scientifically known as Lepidium meyenii, is also referred to as Peruvian ginseng. Maca is a superfood and adaptogenic herb with an outstanding ability to increase energy, stamina, mental focus, and strength. It supplies iron which aids red blood cells to transport oxygen throughout the body and therefore reduces tiredness and fatigue. Maca can contribute to normal immune and cognitive functions. I am very picky when it comes to supplements or “pre-workout” drinks. Many pre-workout drinks may make you feel jittery, give you palpitations or simply make you feel off. (Someone at the gym recently told me about that, and there’s research demonstrating that some of these drinks are harmful). Energy drinks for starters can be detrimental to your heart health. I am back at the gym full time since my back is doing better and my physical therapist gave me the green light. I was recently researching for ways to increase energy and vitality naturally without harmful chemicals or side effects for my pre-workout shakes. Maca was one of my choices because it is natural, it tastes great and has a long history of health benefits. Maca has a delicious malt flavor, and it absolutely works. I drink a shake before my work out and I’ve noticed the difference. Maca root powder is a fantastic source of protein, fiber, several minerals and vitamins, including vitamin C, copper, and iron. Additionally, it contains over 20 different types of amino acids — including all eight essential amino acids — and plenty of health-promoting phytonutrients. Maca contains quite a few beneficial plant compounds, including glucosinolates and polyphenols, and is a popular choice for the vegan diet. Why Did I Choose Maca as My Natural pre-workout Drink? In animal studies it was revealed that Maca enhances endurance and performance. Maca root contains a fair amount of fiber, is a good source of carbs and protein, and it’s also high in some essential vitamins and minerals, such as vitamin C, copper, and iron (see above). Sports Performance ~ Along with a clean diet, and exercise (cardio and strength training) maca is the ideal superfood for your pre and post work routine. Additionally, it may help increase muscle mass. Maca is anabolic – The word “anabolic” itself means building up muscle, and that’s something Maca helps to do. That makes Maca unique among all supplements for muscle building. Maca boasts remarkable adaptogenic properties– just like the superfoods ginseng and Ashwagandha . You can use Maca as an additional boost before a big workout. Stress Management ~ Maca is commonly known as an adaptogen to support and help balance the body, particularly during stressful circumstances. It is rich in a number of key enzymes, minerals, vitamins, and amino acids that our body can use during heightened levels of stress. Maca may support homeostasis (when the body is in a state of equilibrium and balance) during stressful times, on when your body experiences a hormonal roller coaster. Mood Enhancer, PositiveWell Being ~ Maca Powder is famous for the adaptogenic-like qualities that enable it to nourish and balance the body’s delicate endocrine system and to help cope with stress and improve mental clarity. It’s loaded with vitamins, minerals and plant sterols which help promote healthy glossy hair and a radiant glowing skin complexion. Maca Powder benefits for men and women of hormone balancing are well established by scientific research. Vivacity ~ Did you know that the Incas in South America consumed maca to endure long journeys, hard work hours and vitality? They also gave it to children to improve performance at school and during sporting events. Good news for men (and their woman ): Maca is a natural male enhancer. It helps increase stamina, endurance and helps with ED (unless you have circulation issues) then that’s a whole protocol. You can check my article on improving circulation and ward off of Cardiovascular disease here. That being said, it has been proven to help men last longer, and have more energy/endurance both in and outside of the bedroom. But that’s not all, women can also benefit from Maca powder to increase libido, enhance mental clarity, and balance hormones. Does it ease the symptoms of PMS and hot flashes, Hello maca where have you been all our lives? Place all ingredients in your Nutri-Ninja (my favorite), blender, Vitamix or favorite mixer. Mix for about 40-50 seconds or until you get the consistency desired. Note: I like to soak Chia seeds in water or nut mil/water 10 mins before I make my smoothie so they expand. The consistency should be thick. Have you tried Maca root? How do you use it, and have you noticed a difference? Share your experiences in the comments below. Goldenseal’s numerous uses are attributed to its antibiotic, anti-inflammatory, and astringent properties. This amazing healing plant has been used for centuries to heal many conditions, making it a must-have in your medicine cabinet. It soothes irritated mucus membranes aiding the eyes, ears, nose, and throat. Taken at the first signs of respiratory problems, colds or flu, Goldenseal helps can help to prevent further symptoms from developing. It has also been used to help reduce fevers, and relieve congestion and excess mucus. It can relieve constipation and may also be used to treat infections of the bladder and intestines as well. The roots and rhizomes of goldenseal contain many isoquinoline alkaloids, including hydrastine, berberine, canadine, canadaline, and l-hydrastine as well as traces of essential oil, fatty oil, and resin. It is believed that the high content of these alkaloids gives its antibiotic, anti-infective and immune stimulating qualities. 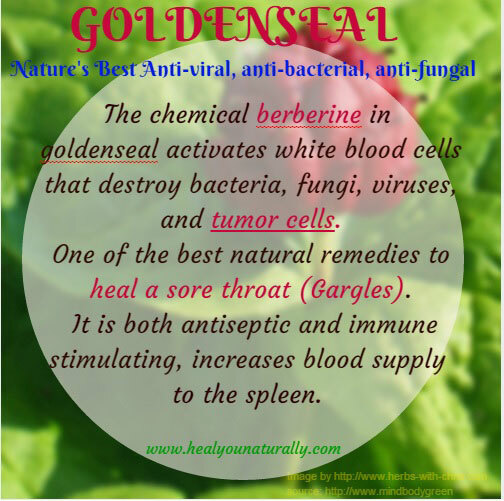 In particular, it is the alkaloid berberine that is most likely responsible for Goldenseal’s effectiveness against bacteria, protozoa, fungi, Streptococci and it also promotes easier removal of the bacteria by inhibiting their ability to adhere to tissue surfaces. Berberine is also anti-fungal and strongly anti-diarrheal. It aids against the infection of mucous membranes such as the lining of the oral cavity, throat, sinus, bronchi, genito-urinary tract and gastrointestinal tract. Clinical studies have shown it is effective in the treatment of diarrhea caused by E. coli (traveler’s diarrhea), Shigella dysenteriae (shigellosis), salmonella paratyphi (food poisoning), Giardia lamblia (giardiasis), and vibrio cholerae (cholera). Do you supplement or have you used Goldenseal? Did you know of its medicinal purposes? I would love to hear your experiences with this fantastic healing herb. As always, thanks so much for reading and sharing my articles. If you have always wanted to introduce natural probiotics, like a Kefir smoothie to your diet, but have NO idea where to start then these 5 recipes are for you! Kefir is such a versatile cultured-food and it can be used both in sweet and savory dishes, from breakfast right through to dinner. I have made salad dressing like in this delicious salad, or in this nutritious probiotic cream cheese like this recipe and even use it in arepas (corn cakes). As a bonus, a lot of my smoothies are carefully crafted with Antioxidant filled super greens, healing mushrooms, top-notch grass-fed whey protein concentrate or plant-based (hello vegan friends), and other wholesome foods or supplements. Additionally, you can use almond or coconut kefir for a dairy-free version of Kefir. Ready to take your smoothies to the next level? 1. Let chia seeds expand (optional): Place the chia seeds in the water and let it soak either 20 mins before making the smoothie or the night before. I like to do this so the chia seeds absorb the liquid, and expand here is why. 2. Place the veggies, fruits and rest of the ingredients in your Nutrininja , blender, Vitamix or favorite mixer. Mix for about 40-50 seconds. In my Nutrininja I like to go the full 60 seconds for a very liquid consistency. Chia seeds are hydrophilic, they will attract water in the body if not soaked or added to liquid, so if you decide not to soak chia seeds, it is best to drink lots of liquids after consuming them. Furthermore, it is possible to get them lodge in your throat if consumed dry, so it is not recommended to consume them un-soaked (they are kind of hard to chew). With that out of the way, let’s move to the next step. 2. Place all ingredients in your Nutrininja , blender, Vitamix or favorite mixer. Mix for about 40-50 seconds or until you get the consistency of your choice. 1. Place all ingredients in a blender bottle or favorite mixer. Mix for about 2 minutes or until all ingredients are perfectly blended. 1. Place all ingredients in your Nutrininja , blender, Vitamix or favorite mixer. Mix for about 40-50 seconds or until you get the consistency of your choice. 1. Place all ingredients in your Nutrininja , blender, Vitamix or favorite mixer. Mix for about a minute or until you get the consistency of your choice. 1. Place fruit, liquid ingredients in your Nutrininja , blender, Vitamix or favorite mixer. Add dry ingredients. Mix for about 40-50 seconds or until you get the consistency of your choice. There you have them. Six awesome smoothies that I love not only because they are nutritious and delicious but most importantly– with a very high nutritional value. Over to you: What are your favorite smoothies? And have you ever made them with Kefir? If you have you been diagnosed with pre-hypertension or have mild hypertension you are going to love this hibiscus tea, better yet– you are going to love the benefits even more. Even if you don’t have high blood pressure, there is nothing wrong with preventing it from developing it to begin with –don’t you think? High blood pressure “runs in my family’, so I have adapted lifestyle changes to prevent that from happening as much as I possible. With that being said, recent studies have shown that blood pressure is the end result of poor lifestyle choices. One of the main ways to stay on top of this is by having your cardiologist or PCP run these two crucial tests every couple of years, in order to assess your risk of Cardiovascular disease (CVD). They help assess your risk of Cardiovascular disease. I try drink Hibiscus tea mainly during the summer-chilled. That being said, there is nothing wrong a warm cup of comforting-healing tea in the winter. Add some raw honey, and we are in business. In vitro studies show Hibiscus sabdariffa L., an ingredient found in many herbal tea blends and other beverages has antioxidant properties, and, in animal models, extracts of its calyces have demonstrated hypocholesterolemic and antihypertensive properties. In this study, their objective was to examine the antihypertensive effects of H. sabdariffa tisane (hibiscus tea) consumption in humans. A randomized, double-blind, placebo-controlled clinical trial was conducted in 65 pre- and mildly hypertensive adults, age 30-70 y, not taking blood pressure (BP)-lowering medications, with either 3 240-mL servings/d of brewed hibiscus tea or placebo beverage for 6 wk. A standardized method was used to measure BP at baseline and weekly intervals. At 6 wk, hibiscus tea lowered systolic BP (SBP) compared with placebo. These results suggest daily consumption of hibiscus tea, in an amount readily incorporated into the diet, lowers BP in pre- and mildly hypertensive adults and may prove an effective component of the dietary changes recommended for people with these conditions. How great is this? An inexpensive way to prevent and lower blood pressure without medications. Yes, the study says pre and mildly hypertensive adults. However, Dr. Diane L. McKay at the Annual Scientific Sessions of the American Heart Association conducted a trial study where subjects drank three cups of hibiscus tea daily for six weeks, which reduced their systolic blood pressure by 7 mm systolic, 3mm diastolic and 4mm overall arterial pressure. That is pretty compelling evidence of the benefits of hibiscus tea. Don’t you think? Do you or someone you know suffers from Blood pressure and if so, how do they manage it? I’d appreciate your comments below. What if I told you that you no longer have to deal with allergies? That there are natural ways to overcome allergies without medications– or worse yet steroids. If so, you are not alone. According to the American Academy of Asthma and Immunology (AAAAI) Roughly 7.8% of people 18 and over in the US have hay fever. In 2012 11.1 million people were diagnosed with allergic rhinitis. Seasonal allergies are irritating, and so are the drugs you take to ease symptoms such as red scratchy eyes, sore throat, sniffling and sneezing. Allergy drugs make you tired, groggy and worse yet– they only mask the symptoms. The greatest pattern we see in allergies isn’t really innovation and it isn’t really medication either– it’s the propensity to go for a more natural approach. The following supplements and foods will help in restoring gut flora in the digestive tract lining. An imbalance in gut bacteria can set off candida fungus also known as (yeast overgrowth)– but most importantly allergies are linked to inflammation: Itchy eyes, swelling, and redness. All of the symptoms related to allergies are again, indicators of swelling: itchiness, irritation, soreness, and swelling, as well. In order to eliminate allergies, you need to get rid of inflammation and hyper-reactivity. A very good place to start is in the digestive tract. One of the most important jobs of the gastrointestinal system is to supply a barrier with external factors such as (foods, irritants, microorganism, and so on) and also your blood stream. This is done in the stomach using all-natural digestive acids to dissolve possibly allergenic healthy proteins in the intestinal tract through a layer of cells that protect against these proteins from entering your bloodstream. Additionally, you have an entire host of unique microorganisms in your gut, in addition to immune cells, who have the arduous task of breaking down and eliminating proteins. Plus, various other molecules that could make it so you become hypersensitive to them, resulting in digestive tract– and also systemic– inflammation. Kefir is a fermented yogurt known for its amazing healing benefits. As we now know, there is a correlation of gut flora imbalances and allergies. Learn about the benefits of probiotics and how to make them from the comfort of your home here. Seasonal allergies are the body’s “alarm bells” to a particular irritant in the environment, which triggers all the typical symptoms. More often than not, people struggling with this are in fact– allergic to pollen. The reasoning behind the concept that local honey controls seasonal allergies is that–by exposing ourselves to the pollen which can be found in honey can assist our bodies to establish a natural tolerance to them, which in turn helps to manage the overreaction and the symptoms. Manuka honey is abundant in phenol. This phenol and phenolic elements affect particular signaling paths in cells which lead to the release of anti-inflammatory cytokines. Additionally, manuka honey is an anti-virual which further prevents infection and speeds up wound healing. Face allergies head before they start. This is particularly essential these days, as allergy season appears to begin earlier every year. A research study of individuals with allergic asthma (asthma induced by allergies) discovered those that those individuals who suffered from severe allergies and took a fish-oil supplement once a day for a month had lower levels of leukotrienes. Leukotrienes are chemicals known to contribute to allergies. Turmeric is a very powerful antioxidant that aids in clearing infections, it is one of the best anti-inflammatory foods to prevent and reverse cardiovascular disease, balances cholesterol levels, treats serious states of depression and even helps reverse the course of Type II Diabetes in pre-diabetic patients. Because of its anti-inflammatory benefits, turmeric can reduce inflammation in the sinus and upper respiratory system making it a great natural tool to overcome allergy symptoms. it can help as a decongestant, and fend off colds. Learn more about turmeric here. Research from this study demonstrated that Quercetin has powerful anta-histamine effects. Histamines are compounds that are released when the immune system detects a sensitivity or allergy, and they are what account for uncomfortable those uncomfortable symptoms we experience whenever the body has an allergic reaction. Quercetin is Naturally found in fruits and vegetables like apples, citrus fruits peppers, dark cherries, berries (blueberries, bilberries, blackberries and others) Tomatoes and red wine. Cruciferous veggies, including broccoli, cabbage, and sprouts. Leafy green vegetables, like kale and spinach. Scientists discovered that Quercetin had the ability to reduce allergies in lab rats by reducing the inflammatory response in the airways. You can supplement Quercetin or add foods rich in it to your diet– especially during allergy season. Pharmaceuticals carry more punch. However, if you wish to go the natural route, butterbur has the very best performance history amongst herbs used for pollen allergies (it’s also used to prevent headaches). Some research studies recommend it can be as efficient for nasal symptoms as an antihistamine, without the drowsiness that comes along with allergy medicine. (Keep in mind that the safety of long-lasting use hasn’t been studied.). Stinging nettle has been around for centuries as a natural treatment for seasonal allergies, hives, asthma, and hay fever. Research studies have actually revealed that taking in freeze-dried pills successfully decreases histamine levels in the body, hence decreasing swelling of affected tissues. Even an easy nettle tea taken in daily during allergy season will substantially reduce allergies. You can also use organic nettle loose leaves. Typical symptoms such as sneezing, scratchy eyes, runny nose, and congested sinuses are dealt with as efficiently, if not more so, by stinging nettle than nonprescription allergy medications. In fact, It has actually been suggested that nettles desensitize the body to irritants and reduce our response to allergens gradually. Nettles will likewise spare you the adverse effects that come along with allergy medications, like sleepiness or inflammation and ulcers of the gastrointestinal tract, which causes an entire set of inflammation concerns you don’t’ want to deal with. Is an excellent natural antihistamine and anti-inflammatory. According to the National Center for Biotechnology Information-– Ascorbic acid is a potent reducing and antioxidant agent that functions in fighting bacterial infections, in detoxifying reactions, and in the formation of collagen in fibrous tissue, teeth, bones, connective tissue, skin, and capillaries. Try buffered ascorbic acid here. Found in citrus and other fruits, and vegetables– better yet lacto-fermented vegetables, vitamin C cannot be produced or stored by humans and must be obtained in the diet. The recommended dose is up to 2000 mg daily. Acupuncture might assist in alleviating and even rid of hay fever, revealed a brand-new research study released in the Annals of Internal Medicine. In the research study, allergy patients who were chosen randomly to attend a few acupuncture sessions had more symptom relief and had to take less antihistamine medication than those patients who got a “placebo treatment” or did not get the treatment. Researchers aren’t entirely sure why acupuncture may help– however think that it “curbs inflammatory immune-system compounds associated with allergies”. According to allergy experts from the University of Kansas Medical Center, If you do not have a high-efficiency particle air (HEPA) filter in your vacuum , you might be making your symptoms even worse by stimulating pollen that has settled on your flooring and furnishings — especially carpets and mats. When you use HEPA filters in your heating or A/C system you can help relieve allergies. Experts in air filtration recommend putting a freestanding air purifier with a HEPA filter in a high-traffic location. Hay fever symptoms such as a runny nose, scratchy throat, and sneezing generally are at their worst in the early morning. What works for many people: taking supplements, teas and home remedies at bedtime. 12. When Symptoms Rear Their Ugly Head: Try Nasal Irrigation. Saline nasal Irrigation (SNI) is typically suggested as an extra nonpharmacologic treatment revealed this 2001 study. Having actually shown its effectiveness in persistent and intense rhinosinusitis and for treatment after sinonasal surgical treatment. One step is to spritz a saline rinse into your nose daily to wash away pollen. This method won’t necessarily replace stronger medications (who wants the drowsiness anyway), but it could reduce your need for drugs along with the suggestions in this article. In a recent study, chronic allergy sufferers who rinsed their sinuses a couple of times a day about six weeks reported less discomfort and nasal congestion than those who didn’t. Remember to leave your windows shut and to try not to spend too much time outdoors on windy pollen-infested days. However, don’t forget that you drag pollen into your house on your shoes and clothing even if you cannot see it. Once you get home wash those clothes immediately; better yet, take a shower right away. Try to move your outdoor workout for the night, recommends H. James Wedner, MD, of the Washington University School of Medicine if your allergies are severe. Not just do many individuals with allergies experience more itching and sneezing in the early morning, trees release pollen at the same time. Additionally, ragweed pollen has the tendency to fly most heavily at midday– so stay with end-of-day walks. Allium cepa – Indicated for bland, non-irritating discharge from eyes; copious, watery, acrid discharge from nose; hoarseness; and feeling better in cool air and open room. Euphrasia – Indicated for symptoms such as copious, watery, acrid discharge from eyes; non-irritating discharge from nose; dry, hard cough; much sneezing; diarrhea; and feeling worse in open air. Natrum muriaticum – Indicated for watery or egg white-like discharges; cold sores; no sense of taste or smell; headaches; and feeling better outside. Nux vomica – Indicated for a runny nose in daytime, then dry nose at night; violent sneezing; nose feels blocked but there is watery nasal discharge through one nostril, and feeling worse outside. Wyethia – Indicated for extreme itching in the nose and throat; throat feels swollen; back of the throat is dry and burning, and sensation as if something were in nasal passages. Read the full article from the original source here. How do you handle Allergy season? Do you prefer natural remedies or medications? I’d love to hear your ideas in the comments below.